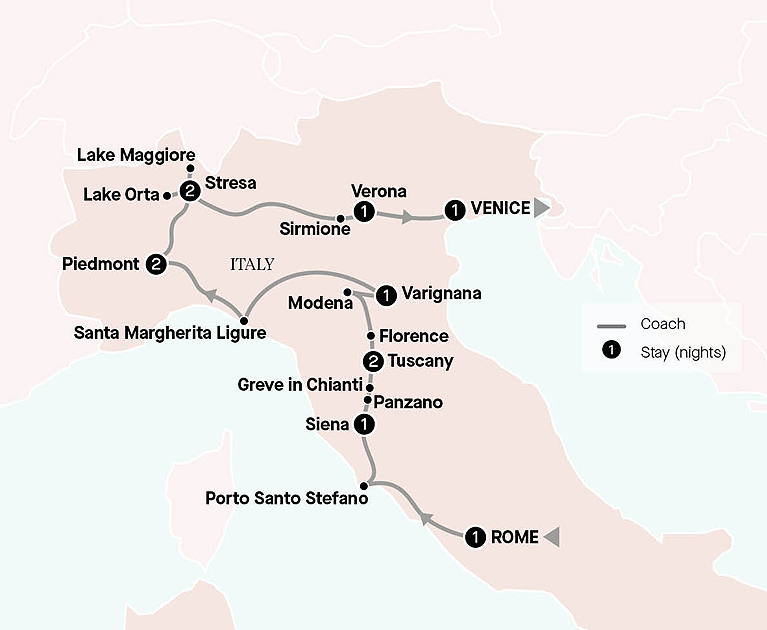 From Rome, Tuscany, the Italian Lakes district and romantic Verona await your arrival. Experience all the things that make this country so spectacular, from the rustic villages to the countryside laden in vines, and food that just makes you smile. 14, 28 May; 25 Jun, 9 Jul, 27 Aug, 10 and 24 Sep 2020 departure, subject to availability. Arrive in Rome by 12 noon and be transferred to your hotel. Enjoy a walk through Rome. Tonight, be welcomed into the home of a local for a special Welcome Dinner. Travel to the Italian coastline and arrive at Porto Santo Stefano. Here, savour a seafood lunch with amazing views. Later, arrive in Siena. Delve into Italy’s culinary delights as a local family prepares a traditional Tuscan meal just for you. Perhaps enjoy a stroll through Siena, before travelling to Panzano for a stop, on the way to Greve in Chianti. Here, delight in a visit to the famous Falorni butchery, operating since 1806. Continue to Tuscany and arrive at your hotel. 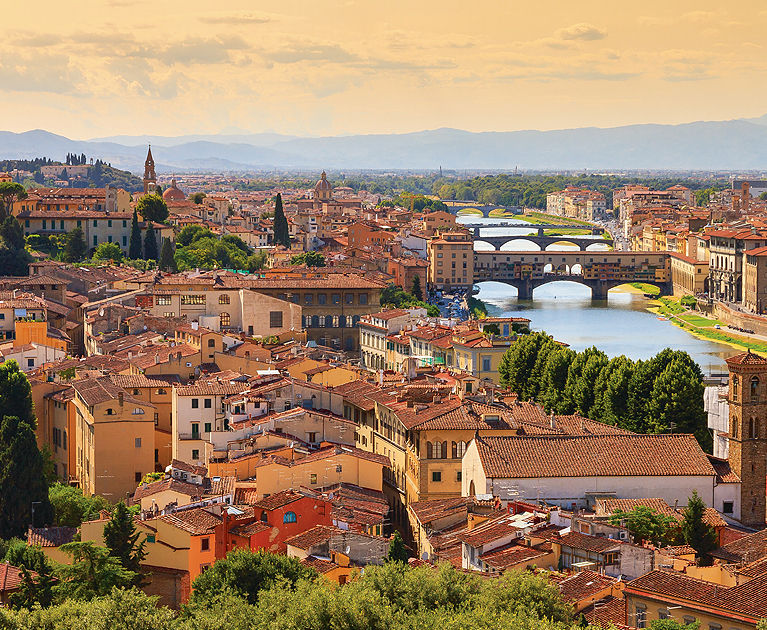 Enjoy a tour of Florence, taking in the Galleria dell’Accademia to see Michelangelo’s Statue of David. Later, visit Florence’s Central Market to sample some local artisan delicacies. In Modena, perhaps visit the Museo Enzo Ferarri. Alternatively, opera lovers will delight in a visit to the Pavarotti House and Museum. Visit a farm, sampling some local produce. Continue to Modena, where you will select from a number of experiences, then travel onwards to the village of Varignana. Travel via the dramatic landscapes of the world-famous Cinque Terre. Arrive at the elegant Relais Villa d’Amelia, in the Piedmont region. Dine in one of Italy’s most exclusive restaurants at your hotel, which has earned a coveted Michelin Star. In Piedmont, visit the World heritage-listedCoppo Cellars in the Canelli wine region. Perhaps enjoy a tasting of the local produce that gives Italy its reputation as the renowned culinary capital of the world. Travel to the scenic Lake District. Along the way, visit a truffle farm. Complete the experience with a selection of truffle-based produce and a glass of wine. Arrive in Stresa. Visit Isola Bella and Isola dei Pescatori on the iconic waterway of Lake Maggiore. Afterwards, venture away from the regular tourist trail as you discover Lake Orta. Visit the home of fashion, Milan. Afterwards, continue via the lakeside Sirmione to the town of Verona, the setting of Shakespeare’s star-crossed lovers, Romeo and Juliet. Enjoy Verona then travel to Venice, where you have the chance to tailor your discovery. Tonight, embark on an intimate gondola ride and enjoy a Farewell Dinner. Advertised prices are person twin share, land only, correct at time of publication and are subject to availability and change at any time without notification due to fluctuations in charges, taxes and currency. Offers valid on new bookings only. Bonuses are included in the advertised price. A first non-refundable deposit of $1,000 pp is due within seven days of booking. Final payment due 100 days prior to departure. ¹Air credit: Offer is not redeemable for cash and is not transferable. ^Deposit Cancellation Cover is valued at $95 per person. Cancellation can be up to 100 days prior to the tour departure and deposit will be retained as an ATG holding credit to be used for future bookings for up to 3 years. If deposit cancellation cover is claimed, monies held must be used on a future cruise or tour and cannot be redeemed against the original cruise or tour departure date. Deposit held in credit will exclude fees imposed by third parties in relation to – air and rail travel, hotels and cabins on Voyages cruises. When booking airfares through ATG (including when taking advantage of a special offer that includes air travel), standard airline cancellation fees will apply. In some cases, airfares will be non-refundable. In the event of cancellation, these fees will be deducted from the deposit paid, and therefore the credit being held. ATG Deposit Cancellation Peace of Mind applies to new bookings only and is only valid up until 100 days prior to travel. Other conditions apply. Please contact your personal travel manager for full terms and conditions.